Does your children's financial knowledge stop at "money doesn't grow on trees"? Fortunately, you can teach them about finances—and the importance of saving for a goal like college—and make it fun. If your child gets an allowance (or a paycheck from a job), there's an easy way to illustrate how to budget. 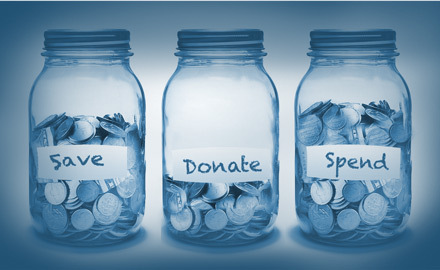 Get three jars (or piggy banks) and label them "Save," "Donate," and "Spend." As soon as your child gets money, have him or her immediately divide the cash into the three containers, following a set percentage you've agreed on. For example, you may suggest putting aside 10% for the child's charity of choice and 25% for saving or investing—leaving the remainder to be spent. You use coupons and scour the internet for good deals before buying anything, right? To show your kids how your extra efforts pay off, track exactly how much you save for a set period of time, like a month. Then go to the bank and withdraw the amount you saved and place it on the kitchen table. Seeing a pile of money representing your coupon savings should make an impact on your kids—plus you'll have a built-in dinner conversation topic.